Do you not know that chaste women stay fresh much more than those who are not chaste? How much more in the case of the Virgin, who had never experienced the least lascivious desire that might change her body? Another explanation suggests that Michelangelo’s treatment of the subject was influenced by his passion for Dante’s Divina Commedia: so well-acquainted was he with the work that when he went to Bologna he paid for hospitality by reciting verses from it. In Paradiso (cantica 33 of the poem) Saint Bernard, in a prayer for the Virgin Mary, says “Vergine madre, figlia del tuo figlio” (Virgin mother, daughter of your son). This is said because, being that Christ is one of the three figures of Trinity, Mary would be his daughter, but it is also she who bore him. A third interpretation is that suggested by Condivi shortly after the passage quoted above: simply that “such freshness and flower of youth, besides being maintained in by natural means, were assisted by act of God”. Yet another exposition posits that the viewer is actually looking at an image of Mary holding the baby Jesus. 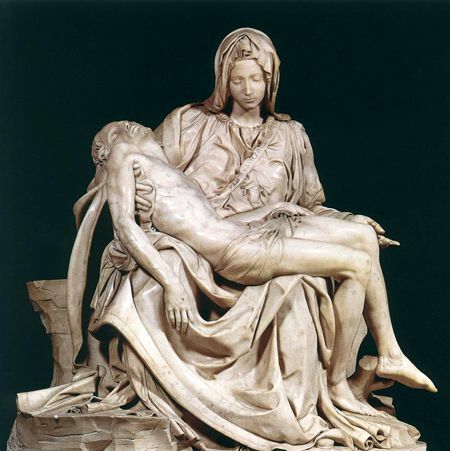 Mary’s youthful appearance and apparently serene facial expression, coupled with the position of the arms could suggest that she is seeing her child, while the viewer is seeing an image of the future. 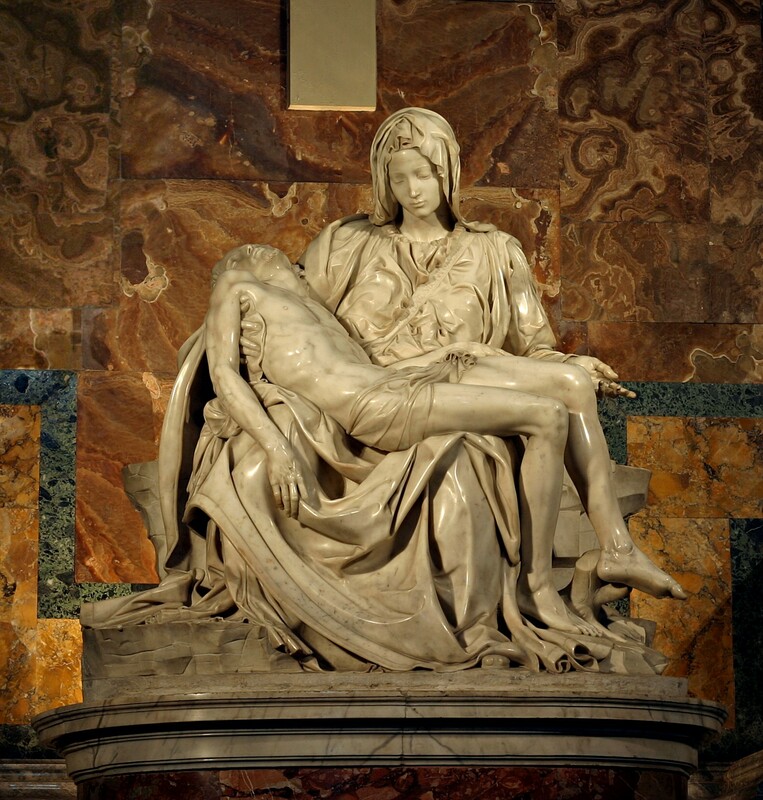 Finally, one modern interpretation suggests that the smaller size of Christ helps to illustrate his feebleness while in his state of death; no longer living, he now appears small in his mother’s arms. Rauschenberg reinvented collage, changing it from a medium that presses quotidian materials into serving illusion to something very different: a process that undermines illusion and the idea that a work of art has a unitary meaning. An overly scrupulous group of de Kooning followers had allowed Abstract Expressionism to become uninventive and Phillip Pearlstein and Alex Katz hadn’t yet succeeded in reinvigorating representation. Then along came Bob and, making it look easy, started assembling the things he saw around him, one next to another, always including aspects of nature, and setting it all off with a whole new approach to painting. Everyone in those days was talking about movement and color, a lot of very formal considerations. 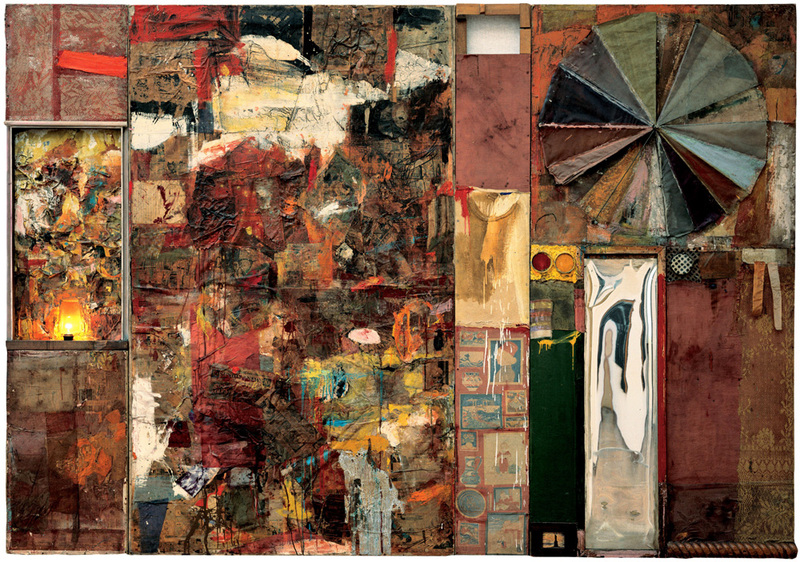 Rauschenberg took a striated, colored umbrella, attached a motor to turn it, stuck it in a collaged mass of paint, wood and photographs and called it “Charlene” (1954). That was what he had to say about color theory and formal art making. The dream catcher above is beautiful and well crafted. But it is not an example of art. Although it is decorative, it is not particularly meaningful. 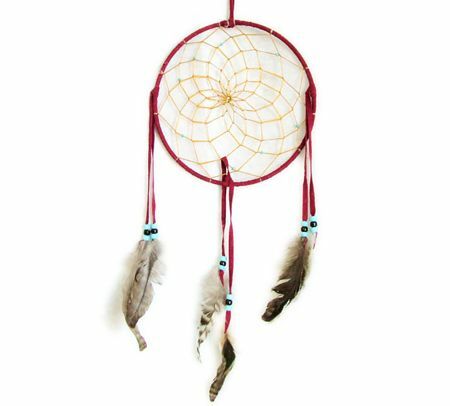 To become a work of art, the dream catcher would have to do more than just catch dreams. It would have to put some dreams into our heads and our hearts. I believe that algorithmic art must now engage in activities that have been “not appropriate” for the medium until now, during those times when it was still trying to find its own aesthetic. But now algorithimic art is finally ready to serve “non-artistic” purposes. It’s not a problem, of course, if some prefer to continue on creating purely aesthetic and visually intriguing objects. There is nothing wrong in doing that, although doing so does not constitute the same “heroic” accomplishment that it once did when algorithimic artists were struggling to break away, and give birth to a new medium. I was surprised to read on OT’s comments that I don’t think art can be beautiful. I don’t recall ever saying such a thing, nor do I hold that belief. Art can unquestionably be beautiful, as I illustrated above. In fact, it was the beauty of fractals that first (strangely?) attracted me to them as a potential source for artistic expression. I remembered how thrilled I was to discover algorithms could be employed to create visual forms illustrating concepts like harmony, balance, and order. The resplendent forms that unexpectedly pop up in fractal generators can still take my breath away. But I agree with Guido, and I agreed back on one of Orbit Trap’s first posts in 2006 when he found the words to give shape to what I had been thinking for some time. There’s nothing wrong with continuing to create and value visually pleasant works — unless it matters to you that our discipline move out of the craft fairs and into the museums. The prevailing aesthetic in our community is beauty, and nearly all fractal images currently made do not transcend to much more than decoration and ornamentation. Fractal art will never become a widely accepted fine art until more of us start making works of artistic expression and stop pretending that aesthetically pleasing works, however well crafted, rise to the level of art. There’s also nothing wrong with creating beautiful images — and doing that well is a considerable achievement. And I think it’s generally a good idea that artists learn as much as they can about their tools in order to practice and refine technique. But if you’re merely honing your Ultra Fractal skills to produce a more technically accomplished, a more shiny and burnished spiral, then you may be perfecting your craft, but you’re no more close to making art than you were on the first day you ever used the program. The problem in our community is that most of us seem to feel that making visually pleasing work is still “heroic” and get defensive when some people, like Orbit Trap, find such a state of affairs to be questionable — even destructive. One reason I am “obsessed” with the Benoit Mandelbrot Fractal Art Contest is that it is a mirror of the state of our discipline. It has a stated objective of presenting to the world the very best in contemporary fractal art, but it actually showcases highly crafted work that is visually striking but little else. With several exceptions that I noted in my initial review of the 2009 BMFAC, nearly none of the winning images suggest any meaning beyond themselves. They say nothing to me about my life — or about life in general. They provoke no thought. They raise no ideas. They stir no emotions. They put no dreams in my head or my heart. Now visit any of those thriving “art” communities OT calls Fractalbook, open up the fractal “art” gallery, apply the standards I used in the last paragraph, and honestly tell me what you see. Are you deeply moved — or are you let down? Do you feel like you’ve seen much the same work many times before? Do you get more satisfaction from watching a good movie or listening to good music — you know, interacting with art — than you do from viewing what’s come off today’s fractal assembly line? And, as you peruse every lengthy comment thread — filled with raves for one masterpiece after another — do you feel a kind of cognitive dissonance and disconnect? Do the universally acclaimed masterworks, even if technically proficient and magnificently crafted, leave you feeling empty? Welcome to OT’s world. That sense of feeling cheated by what the crowd perceives as worthy of acclimation is why we feel our community needs to develop Phase Two thinking. The craft mindset has to be seen for what it is. The worship and privileging of any particular software and its programmers and its advocates should be shown the door. The status quo is not “heroic”; it is, in fact, keeping us from leaping to artistic expression — from evolving into multiple mediums and developing much greater variety of individual creative styles. We should start insisting that art be showcased in our fractal art competitions and begin pushing our own work beyond cosmetics and aesthetic enhancements. If fractal art is art, then we should act accordingly and immediately fire up works that are provocative, disturbing, intriguing, challenging — works that are socially and culturally aware. 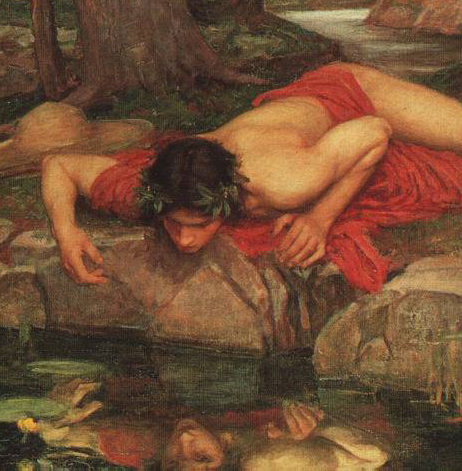 We need to look up from the Narcissus pool of our own eyecandy. Don’t you have something to say about the worlds out there — whether inner, outer, or cyber? You know I’m right on some basic level. Although I don’t buy into the stereotype that beautiful people are somehow intrinsically vapid, we do like to point out that “beauty is only skin-deep.” I think most of you would agree that making an assessment on just the attractiveness of others is a shallow method for measuring anyone’s true worth. So we do why operate in just such a manner when assessing fractal images? I don’t know about you, but I want my beautiful fractal images to also have a brain — a brain that is interesting and expressive — a brain that sees connections beyond the confines of its body, frame, program, par files, monitor, mentor, mathematics, craftsmanship, and, yes, even its own gorgeousness. Guido got it right. Beauty is not enough — especially if we want to become legitimate, credible artists. Do you want to do something truly heroic? Make your fractals make art. We sort of come to a dead-end. Personally, I have not looked deep enough at the winners of the BMFAC, their titles and the rest of the artists’ galleries to say that the artists didn’t have any artistic concern and were merely seeking beauty. A single work of art, with just the title present, is very unlikely to tell you something right away, with a 5-second glance at a thumbnail – more so with abstract art. A Pollock canvas tells you almost nothing right away, unless you know who Pollock was, some of his other works, how he worked on his paintings, why he’s considered innovative, and what he, himself, said about his art. Even the date it was done in has importance since art has a strong connection to the social goings-on at the time it was thought out and executed. It’s a whole, an artwork doesn’t end in the visual itself. I’m not claiming that each and every winner of that contest had higher intentions with what they were doing, but it’s quite unfair to rule that possibility out right away unless you know the artists themselves, and have looked a bit further than the single tiny image they have presented there. That there, is the main flaw of the contest I think. I have never walked into a gallery or an exhibition room that didn’t have a description of the general concept and context, in addition to short descriptions of some of the works if not all. The contest doesn’t give the artists the opportunity to connect to the viewers and explain themselves. It’s a matter of interpretation too. Whether the artwork talks to an individual is the single criteria that puts it into an art or non-art category in that individual’s head. I can’t blame you for not being inspired by any of the works there, but that still doesn’t allow one to make universal claims based on one’s personal interpretation of the works. I, for one, don’t dare claim that none of the artists there had a paragraph or two to say about their works (even though it just might be the case), simply because they weren’t given the opportunity to demonstrate that. Another point worth making is that art has never been “popular”, so it’s naive to expect the majority of those working with fractals be involved with art. Art, simply due to its subjectivity, will rarely be collectively interpreted and appreciated the same way. It is, by nature, elitist. It requires the artist and the viewer be at the same intellectual level to connect. Image of the Week: Harmonics by "O"
Give it up for CO99A5!